The initial enlistment paygrade in the United States Air Force is E1 (Airman Basic). However, certain categories of applicants can enlist in the United States Air Force and receive advanced pay grade status of E2 or E3. These programs generally require the applicant to already be in the Tier 1 education category (in other words, no double qualifying; if the applicant is using their college credits to qualify for Tier 1, those same credits cannot be used to also qualify for advanced paygrade). An applicant needs to meet only one of the qualifications listed for advanced paygrade, not all of them; meeting more than one qualification does not make the applicant eligible for additional advancement. Those who have satisfactorily completed 45 semester hours or 67 quarter hours of credit from an accredited, degree-granting institution listed in the applicable AIPE directory for last year attended. Documents for these programs must be presented as a part of the enlistment program. 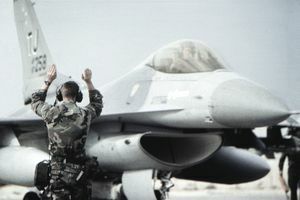 In addition to the above, recruits who are enlisting for a period of six years are promoted from Airman Basic (AB) or Airman (Amn) to Airman First Class (A1C) upon completion of one of two technical training programs: the indoctrination course and Pararescue, or 20 weeks of technical training, whichever occurs first. The Date of Rank (DOR) for A1C is then adjusted to the date completed Basic Military Training (BMT), but without back pay and allowances.